Island architects have designed the property to take full advantage of its natural surrounding environment by creating a modern and simple living space with amazing wide open view. The Trees Residence project, we are using only quality materials and natural finishes allows you to experience a harmonious way of living. Our residence located 30 minutes by taxi from Phuket International Airport, 20 minutes from Phuket town and 10 minutes to Patong beach. 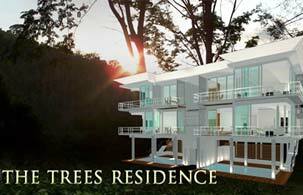 Located in the heart of Kamala, the trees residence is set up into the hillside surrounded by a stunning natural forest that delivers a purely natural and tranquil atmosphere under a canopy of trees. The design of the trees residence is simple but yet modern which takes full advantage of the surrounding environment, helping to capture the stunning views and natural breeze with the use of large sliding doors and windows with walk around terraces. Using quality local materials with natural finishes creates a relaxed and stylish property. All units come fully furnished excluding electrical appliances with a fixed parking space. 49 % of the condominium units will be available to foreigners as freehold while the remaining 51% being available as lease hold.